Now up to 6 players can play with the rich set of 4 variants and 5 scenarios in Catan: Traders & Barbarians! This 5-6 Player Extension allows you to expand and inject more excitement into your games without sacrificing ease of play. Add more players and even more drama to the award-winning game of culture, politics, discovery, and conflict. 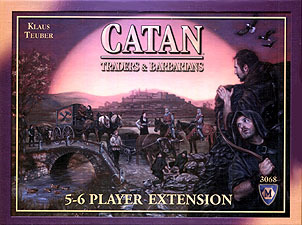 You will need Catan: Traders & Barbarians, The Settlers of Catan and The Settlers of Catan 5-6 Player Extension in order to play with this game extension.